Removes inflammation and nourishes joint tissues. No synthetic colorants and flavoring agents. Can be used in productive horses. 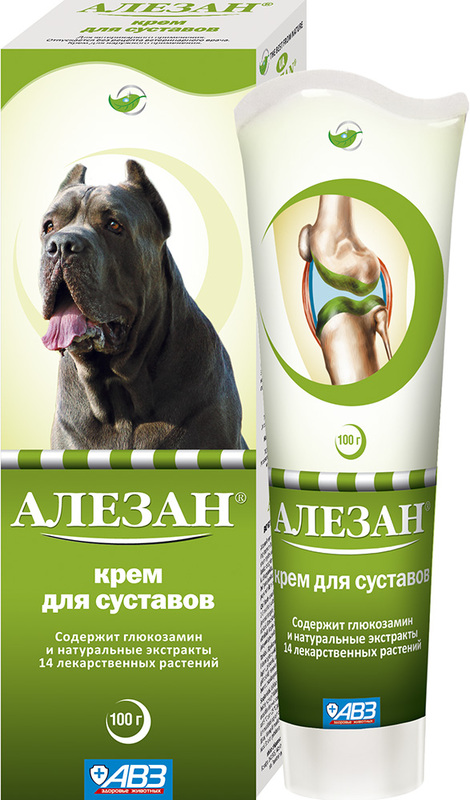 Alezan cream for joints is a drug regulating cartilaginous metabolism. Alezan cream for joints stimulates cartilaginous tissue regeneration, provides anti-inflammatory and analgetic effect, prevents cartilage destruction and promotes tissue regeneration. Glycosamine with chondroprotective properties participates in biosynthesis of proteoglycans and hyaluronic acid. As a specific substrate and stimulant of synthesis of proteoglycans and hyaluronic acid, it selectively influences on articular cartilage, inhibits formation of peroxyl radicals and enzymes (collagenases and phospholipases) damaging cartilaginous tissue. Excipients promote active ingredient penetration through skin, blood circulation activation, liquid excretion, oedema removal and decrease in pain syndrome, soften and moisturize skin. Store in closed original package at 0-25°С. Protect from light. Shelf life is 18 months when stored in accordance with regulations.